Following the publication of Thomas Piketty’s 696-page tome, Capital in the Twenty-First Century, economic inequality is still at the forefront of public debate. In 2015, it has shifted its focus from the distribution of income to that of wealth, as new measures show that the wealthiest have claimed an increasingly larger share of total wealth in recent decades. 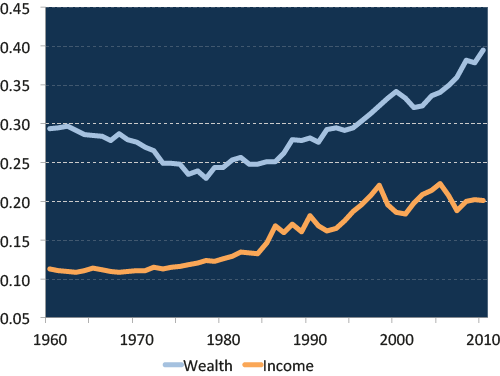 In their study of US tax records, Saez and Zucman (2015) estimate the share of wealth owned by the wealthiest 1% of tax units (a concept close but not identical to a household) to be 42% in 2012, up from 28% in 1960 (see the blue line in Figure 1). Sources: updated data files for Piketty and Saez (2003), and Saez and Zucman (2015). A number of factors have been proposed to explain the surge in wealth concentration (see, for example, the recent VoxEU pieces by De Nardi et al. 2015, Kanbur and Stiglitz 2015). Much of the debate focused on changes in US tax policy as a major potential factor, as the effective tax rates on top income earners in the US have substantially declined in recent decades. The top marginal federal income tax rate was reduced from 91% in 1960 to 35% in 2010 (see Figure 2). 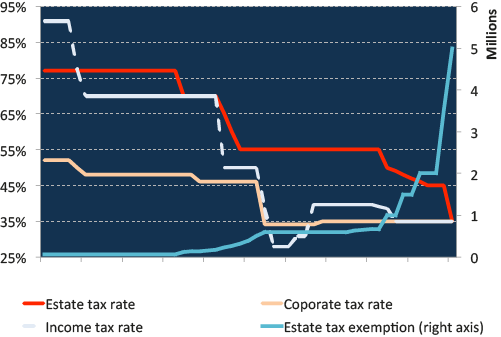 Furthermore, lower rates of corporate and estate taxes, combined with more generous deductions and exemptions from these taxes, have disproportionately benefited top income groups (Piketty and Saez 2007). Sources: NIPA, Joulfaian (2013), IRS. A competing explanation emphasises changes in the economic environment, particularly in production technologies, that favoured skilled workers and widened the wage distribution. In fact, the concentration of wages, earnings and income has increased by more than that of wealth during this period. 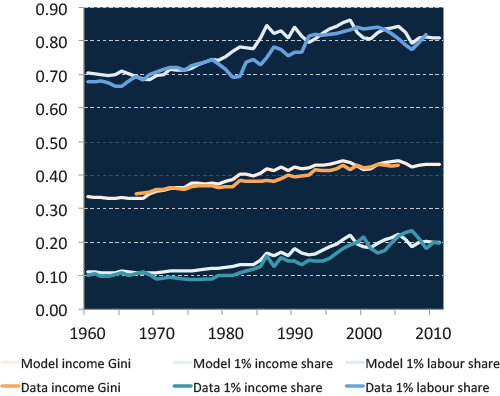 The top 1% share of income, for instance, doubled from around 10% in the 1960s to around 20% in 2010 (see the red line in Figure 1). Unless top income earners reduce their saving, this almost directly translates into higher wealth inequality. 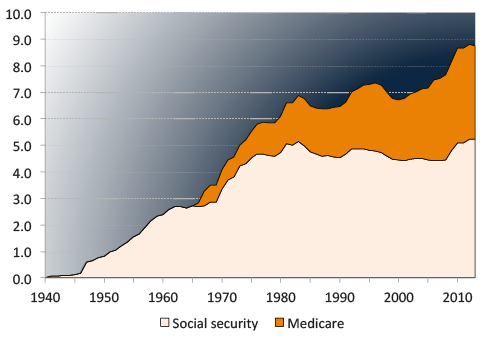 Another important and often overlooked third factor is the rise in the generosity of government transfers since 1960, mostly due to the expansion of public pensions (social security) and the introduction of public health insurance for the elderly (Medicare). Combined spending on these two programs accounted for almost 9% of US GDP in 2010, up from less than 3% in 1960 (see Figure 3). These government programmes tend to curb the need to rely on personal savings for retirement, especially among low and middle-income households, and might thus explain why their share in total wealth has declined. In a recent paper (Kaymak and Poschke 2016), we provide a quantitative analysis of how changes in taxes, transfers and in the wage distribution have affected the wealth distribution. Understanding the sources of wealth dispersion is an indispensable first step before inferring its implications for welfare and discussing the efficacy and desirability of policy responses. For instance, if the surge in wealth concentration is a result of tax and transfer policy, then it may be reversible – leaving only the question of desirability. Reversing the surge in wealth concentration would be much harder if it is driven by technological change. Moreover, even if it were reversible, it is not clear that it would be desirable. If the observed rise in wealth inequality is a result of more generous transfers, as opposed to top income tax cuts, then it would bring about lower consumption inequality. The model economy can thus be used as a laboratory to study how households react to changes in policy and in incomes like the ones that occurred since 1960. Aggregating individual responses then shows us how aggregate economic outcomes and the wealth distribution evolve. Sources: updated data files for Piketty and Saez (2003), and Kaymak and Poschke (2016). The main results are shown in Figure 5. The white line shows the path of the top 1% wealth share in the model. It tracks the evolution of the data closely, in particular since 1980, indicating that the model does a good job at reproducing the overall evolution of wealth concentration (the model performs less well in the 1970s, a decade in which large fortunes where affected by a series of shocks that are not captured by the model). Given this success, we next use the model to make predictions for counterfactual scenarios, shown in the other lines in the figure. To gauge the importance of the three potential drivers of wealth concentration discussed above, we simulate two scenarios. 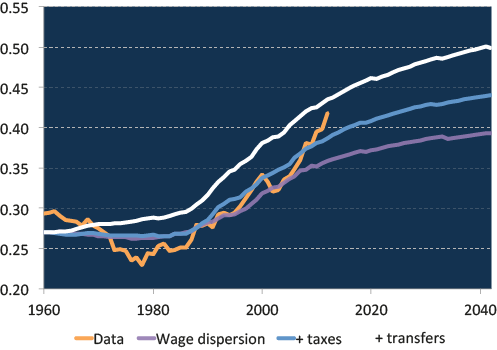 The first one only features increasing wage dispersion, in line with the increase in earnings dispersion observed in the data, and abstracts from changes in taxes and transfers. The second one additionally incorporates lower top income taxes and lower corporate and estate taxes, as observed in the data. The purple line shows the top 1% wealth share for the first counterfactual scenario. It is clear from the figure that technological factors play a dominant role not only for changes in income inequality, as is well known, but also for wealth inequality. As high-earning households save part of their additional income, their share of wealth also rises. This channel accounts for about half of the total increase in wealth inequality. Tax cuts and the expansion of transfers each account for about half of the remainder (the gap between the purple and blue lines shows the effect of tax cuts, while that between the blue and white lines shows that of increased transfers). While tax cuts encourage saving, larger transfers reduce saving incentives for retirement, in particular for low and middle income groups. This implies that these groups’ share of private wealth declines. Note though that this is partly due to the fact that measures of private wealth inequality, like those compiled by Saez and Zucman, do not include claims to future government transfers, like social security, which constitute wealth for their owners. Studying the paths of income and consumption inequality in a similar way leads to two notable results. First, the top pre-tax income shares barely respond to tax changes. This is because lower taxes drive up savings and, hence, reduce the rate of return on capital, counteracting the effect of tax cuts on top incomes (lower interest rates have recently been an important topic of discussion among economists; see e.g. the VoxEU pieces by Sir Charles Bean 2015 and John Williams 2015). Second, higher government transfers have counteracted the increase in consumption inequality due to lower taxes on top earners. As a result, consumption inequality rises less than after-tax income inequality. In his book, Piketty makes an attempt to forecast the evolution of wealth inequality. Our analysis also allows us to do so. Since wealth concentration reacts fairly slowly to changes in the economic environment, we find that the effect of more recent changes in fiscal policy and wage dispersion has not yet materialised fully. As a result, our model predicts two more decades of rising wealth concentration, at the end of which the wealthiest 1% will eventually hold approximately half of the total private wealth in the US. Our analysis attributes most of the increase in wealth inequality to the rise in wage dispersion. Since the latter is often attributed to skill biased technical change, a substantial part of the increase in wealth inequality is likely to persist even if tax policy were to return to 1960s levels. The results also highlight the role of transfer policies in explaining wealth dispersion, a factor often neglected in discussion of policy-based explanations for income and wealth inequality. Put differently, statistics on wealth inequality that do not capture households’ claims on the public sector are incomplete and overstate top wealth shares. This calls for future research documenting the distribution of claims on the public sector to help put studies on wealth and income inequality in perspective. Bean, C (2015), “Causes and consequences of persistently low interest rates”, VoxEU, 23 October. Castañeda, A, J Díaz-Gimenez and J-V Ríos-Rull (2003), “Accounting for the U.S. earnings and wealth inequality”, Journal of Political Economy 111 (4): 818–857. De Nardi, M, G Fella and F Yang (2015), “Piketty's book and macro models of wealth inequality”, VoxEU, 22 December. Joulfaian, D (2013), “The Federal Estate Tax: History, Law and Economics”, US Department of Treasury, Office of Tax Analysis. Kanbur, R and J Stiglitz (2015), “Wealth and income distribution: New theories needed for a new era”, VoxEU, 18 August. Kaymak, B and M Poschke (2016), “The evolution of wealth inequality over half a century: The role of taxes, transfers and technology”, Journal of Monetary Economics 77:1-25. Piketty, T and E Saez (2003), “Income inequality in the United States”, Quarterly Journal of Economics 118 (1): 1–39. Piketty, T and E Saez (2007), “How progressive is the U.S. federal tax system? A historical and international perspective”, Journal of Economic Perspectives 21 (1):3–24. Piketty, T, E Saez, and S Stantcheva (2014), “Optimal Taxation of Top Incomes: A Tale of Three Elasticities”, American Economic Journal: Economic Policy 6(1):230-271. Saez, E, and G Zucman (2014), “Wealth inequality in the United States since 1913: Evidence from capitalized income tax data”, NBER Working Paper 20625. Williams, J C (2015), “Will interest rates be permanently lower?”, VoxEU, 26 November. 1 The model is a variant of the ‘standard incomplete markets’ model and builds on work by Bewley et al. and on more recent work by Castañeda et al. (2003). 2 The latter is consistent with a strong role for rising wage dispersion in explaining patterns of inequality. If corporate and estate tax cuts were the dominant factor, we would instead have seen a rising share of capital in top incomes. 3 Although r>g in the model, the top 1% share converges to a finite level. The reason is that even if very wealthy households also have high saving rates, they still consume some amount. This bounds their wealth accumulation.